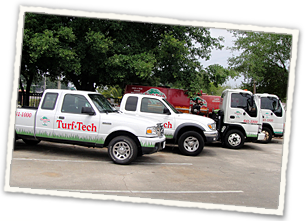 Turf Tech, Inc. was started in 1978 by Gary Moreau, who’s continued oversight and leadership has led to the best lawn spraying company in North Florida. We have completed work for many well-known local areas such as Sawgrass, TPC, Queens Harbor, Anheuser-Busch’s sod farm, Duval County Athletic Fields, the Jacksonville Jaguars practice fields, and Walt Disney. We believe in providing the highest level of customer service possible and we always do our best to make sure our customers are satisfied. Turf Tech Lawn Spraying Inc. Turf Tech’s employees are very knowledgeable, and we believe in promoting from within the company to ensure that every supervisor and manager is thoroughly trained in their field, as well as in Turf Tech’s business philosophy. Each of our supervisors has been with the company for over 13 years. Because of this, they know our customers, along with their properties, very well. This approach pays off for everyone; especially our customers, who benefit from knowing the same supervisor will continue to be overseeing their lawn. We have customers who have been with us for over 30 years and have only had two or three different supervisors over their lawn the entire time. Turf Tech is a second-generation family business. Corey and Andy Moreau have grown up in the lawn spraying and pest control industry, and are now in leadership roles within the company. Having a degree in Business Management from UNF, along with extensive experience in the field, Corey is running the day to day operations within the office. Andy, on the other hand, is primarily out in the field. He oversees many of our treatments and ensures we continue to provide the results and excellent customer service that our clients have come to expect from us. Our goal for the future is to continue our level of professionalism and commitment to the turf industry and to our customers. We are constantly adapting to the changing economy, new chemical regulations, water restrictions, and weather conditions. We see these as not only challenges, but also opportunities to improve our services to our customers.